The Akumaizers can't catch a break. In this episode, Zabitan struggles with the realization that his childhood friend is now a bitter enemy. And to make matters worse, Mezalord is back again! Will Zabitan be able to talk his friend out of invading Ginza? And will he be able to stop Mezalord from wiping out the Akumaizers? 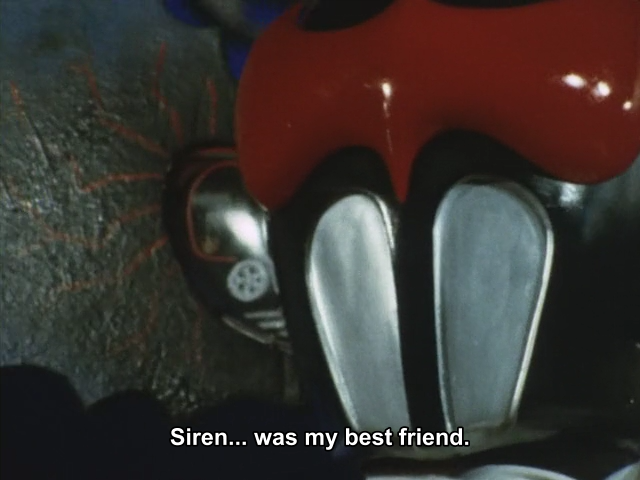 Another emotionally driven plot for Akumaizer. Maybe now you're all starting to see why I love this series so much. Its more than just a tokusatsu action franchise, it has real heart. And I was always impressed with how much emotion the suit actors could convey. Pay special attention to the spectacular lighting in the scene at the end of the episode. It lets you feel the emotion the characters are feeling, despite the fact that Darunia is there looking as freaky as ever! How are you guys liking this release blitz? Stay tuned this week for Stronger 34, and after that... the triumphant return of Skyrider! We're working on the scripts we have. We'll get to everything in time. There are many Stronger and Akumaizer fans that feel the same way you do! Kamen Rider Stronger episode 34! Kamen Rider Stronger episode 33!